Stitched Together: Stitched Together Crafting Library KAL & Other "Stuff"
Stitched Together Crafting Library KAL & Other "Stuff"
I am sorry that I have been missing from the blog and podcast over the last few weeks. I have been trying to keep up with the KAL over on the Ravelry Board but I have been away from pretty much everything else. After my microphone gave up the ghost I had an evil cold and just as I was getting ready to start blogging and podcasting again I got hit by some family "stuff". I won't go into any details, but suffice to say this is probably going to take up some energy that would normally be used for blogging and podcasting for a while. As you know, I only have very limited reserves of energy! I am going to try and podcast later this week, but I can't guarantee it. I just thought I'd let people know that I'm not more ill than normal it's just my energy is being used elsewhere at the moment. I am still listening to, and watching, podcasts and reading blogs and commenting, I'm just not generating anything myself. 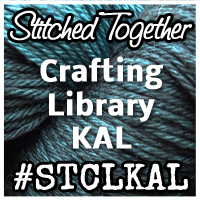 Like I said, I am still keeping on top of the stuff going on with the Stitched Together Crafting Library KAL, I just haven't been working on my own project because it requires too much thought. The KAL is still going on, and there are still a few weeks to get your three posts into the Progress Thread. There are several people that have reached their target of three posts AND posted into the FO Thread, to get a bonus entry. I'd like to remind you that only posting in the FO Thread is NOT going to get you an entry into the KAL draw, you have to post three times in the Progress Thread first, before you are eligible to enter for an additional time into the FO Thread. I am so impressed with the projects people have been working on. Everyone has been so supportive of each other which has made me very happy, as that is what I wanted this KAL to do, was to get people talking to each other while it went on. That is the reason why the requirements are not just "post an FO", I wanted people to communicate with each other whilst they were working on things. I hope you agree that part of the KAL has been a roaring success!